So today I did it. Signed my life away....that 10km race I signed up for a couple of months back just on a whim (and then proceeded to do nothing about for at least a month after) Remember?! Well today in the space of a 2 minute phone call that 10km race grew to 21km - gulp - uh-oh!! And I owe it almost entirely to this little device. The best $25 I've spent in a long time. The Nike+ sensor. 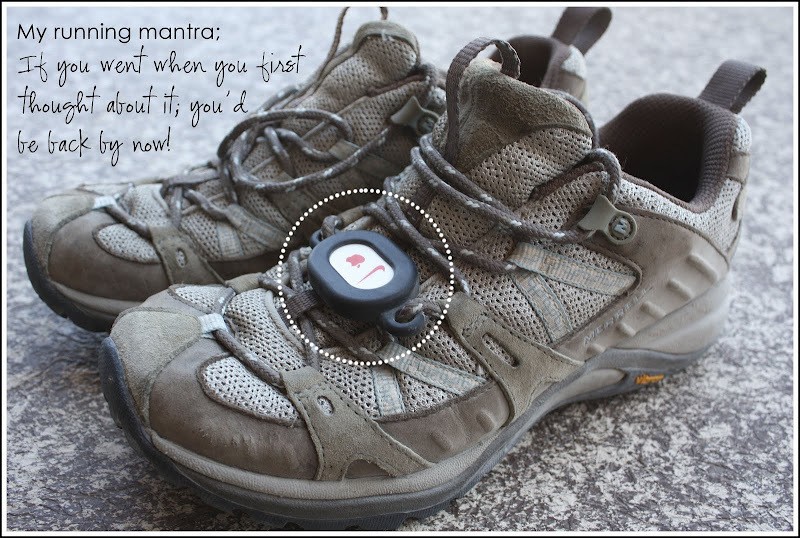 Slip it in a pouch on your shoe, sync it with your iTouch/Phone and off you go - music on the go, a running log and personal trainer all rolled into one! It's awesome! And you've gotta smile when Paula Radcliffe gives you a pat on the back for your longest run to date or Lance Armstrong congratulates you for your new PB time! (yes, yes - little things please little minds!). Since getting the device at the end of June I've logged over 115miles! And I'm LOVING it! I admit I've been chewing over the 1/2 marathon a few weeks. Once I got stuck back into a running routine of 3-4 times a week the 10km suddenly didn't seem so much of a challenge. I've done maybe 8 or 9 10km races in my humble running career (even if the most recent was 4 years ago with next to no aerobic activity in the last year at least) but I was up to distance and pace within the first 2 weeks! Having always previously aimed to simply complete I used to be stuck in a rut in terms of pace and never really improved. This time round it felt different. I wanted to be better, faster. I was running longer distances (so as to make the 10km seem easier on the day!) but I realised I could push myself and go further still - to the next level entirely!! I started reading up on all sorts of 1/2 marathon training plans and starting pushing the distances of my runs (All the while keeping the idea to myself). I eventually mentioned it to Chris a week or two ago but today I actually made the switch with the registration. But now the figures on the scale don't matter at all (just as well because they seriously haven't shifted in 6 weeks - go figure). I don't feel like I'm running because I need to or have to - I'm doing it cause I WANT to (you know when you were a kid and you took exercise for granted - you did it just because it was fun, not with the ulterior motive of health/fitness/weight control? - well that's how it feels right now) Honestly I'm scared as heck that this is a fad and I'll burn out or get bored - but for now I'm riding the wave! And last weekend I ran my first 10 miler - my first double digit run! And I could have auditioned for the role of the Cheshire Cat right there and then (more so when Lance started gobbing off in my ear!!) - Go me!! Awesome my friend. You GO!